Perhaps no other steam locomotives in South Africa inspired so much awe and interest among railway enthusiasts than the class 25 4-8-4 engines that look so much like New York Central Niagaras and pulled hard, fast and loud. Introduced at the end of the world steam era in the 1950s, these magnificent machines lasted until the bitter end. Professionally photographed and produced locally in South Africa by Vidrail, a widely respected railroad videography house, this program brings to you the best of the best action runbys shot over many years. This program covers the final years of the class 25 engines in regular service from 1989 to the end plus preserved operations and charters that ran through 2004. The main stomping ground for these engines was the Kimberley to DeAar racetrack, but they wandered off as the years progressed. The technical features of this engine class (both condensing and non-condensing) are reviewed here. The Red Devil class 26, developed from a class 25 in a successful attempt to demonstrate the possible performance and efficiency enhancements of steam locomotives, is seen a variety of times. Most of the Class 25s that were running during the years covered by this program appear on screen. We also have guest appearances of other classes of power (e.g. 4-8-2 and 4-6-2). 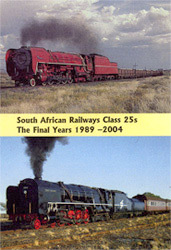 Various special charter trains are given their due including the doubleheaded Trans Karoo express trips in the 1990s, a Class 25 venturing into Zimbabwe in 2001, plus special freights and unusual routings of the Red Devil. Appropriately narrated.